Come home to the best in mid-rise apartment living in Downtown San Diego at Camden Tuscany. Nestled in Little Italy, this apartment community has a variety of large one, two and three bedroom floor plans that boast spectacular views of the San Diego Bay. Through your front door at Camden Tuscany, you will be greeted with a spacious open-concept apartment home and a gourmet kitchen perfect for entertaining with granite countertops and stainless steel appliances. There is no compromise when it comes to convenience and style, as our apartment homes are complete with a full-size washer and dryer in your home, USB-enabled outlets, hardwood-style floors and carpet along with windows that showcase beautiful ocean, garden or pool views. Select a top floor apartment home to take advantage of our two-story loft floor plans. Extra perks include a gated parking garage with assigned parking spaces and a technology package included in the total monthly rent with a savings of up to 50% retail. This money-saving package includes high-speed internet at speeds up to 100 Mbps and over 280 digital video channels plus HD programming with full multiplex of HBO through Cox Communications. 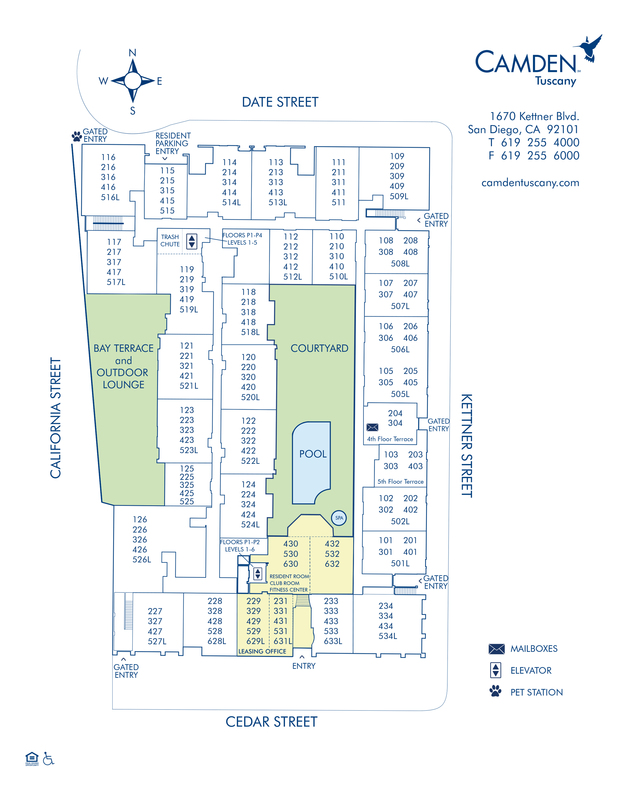 Camden Tuscany makes achieving a balanced life easy with amenities right outside your door. Leave the costly gym membership behind when you visit our 24-hour fitness center with professional cardio equipment and free weights. When you’re looking for a staycation or a place to enjoy the California sun with friends, head to the resort-style swimming pool with a hot tub and poolside grilling stations. The best place for some friendly competition is our game room with a flat-screen TV, billiards and card table. Your pets will love where they live too with Amici Dog Park a short walk away and a variety of pet-friendly restaurants nearby like crowd-favorites The Crack Shack and Craft & Commerce. Our Downtown San Diego location makes it easy to immerse in the culture of one of San Diego’s favorite neighborhoods, Little Italy. Camden Tuscany sits just blocks from Waterfront Park, a year-round neighborhood entertainment destination on the North San Diego Bay shore where you’ll find concerts and outdoor events set in beautifully manicured green space. One of the best ways to spend a Saturday is at the Little Italy Mercato Farmer’s Market just steps from your front door. Enjoy local arts, produce, entertainment, and most of all the food! A short walk also brings you to the Little Italy Trolley Station that can take you to Petco Park for a Padres baseball game. Whether you’re in the mood for water sports at Mission Bay, a day at the San Diego Zoo, lunch with an oceanside view or a night out in Little Italy, Camden Tuscany puts you in the center of it all. Come home to Camden Tuscany, where the best of Downtown San Diego living sits right outside your door! Breed Restrictions: American Pit Bull Terrier, American Staffordshire Terrier, Staffordshire Bull Terrier, any mix of the previous breeds, or any other dog or breed deemed aggressive. Ask us about our pet interview process! See management for pet approval. Get the perfect spot! We have a gated underground parking garage that includes one parking space per apartment home. Additional parking spaces are available for $150 per month. Please call us for details!